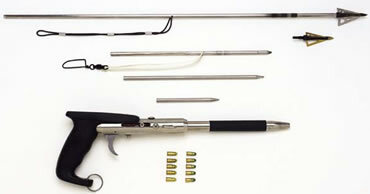 This is the most powerful spear gun in the world: it can shoot a 1/4” shaft through a piece of 4x4. 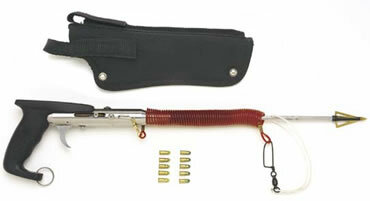 This gun is powered by a .22 caliber blank shell, the same ammunition that is used to shoot nails into concrete. Although it can shoot a spear up to fifteen feet, and be used for shooting fish under ledges, in holes, or at close range, its main purpose is to kill a struggling tethered fish so it can be easily handled and bagged. It is also an excellent defense weapon against bold sharks, and can be used as an emergency signaling tool. All stainless steel construction. Note: Will not fire live ammunition! Range: Proportional to the length of the spear, up to 15 Ft. Spear: 1/4” diameter, available from 8”-24”. Underwater reload time: 30 seconds. Long spear shaft with BH-1 broad head. Short spear shaft equipped with interchangeable carbide tipped point is designed for shooting under the ledges and in the holes. Long dart is used as a defense weapon for longer distance. Same as above except used for short distance.